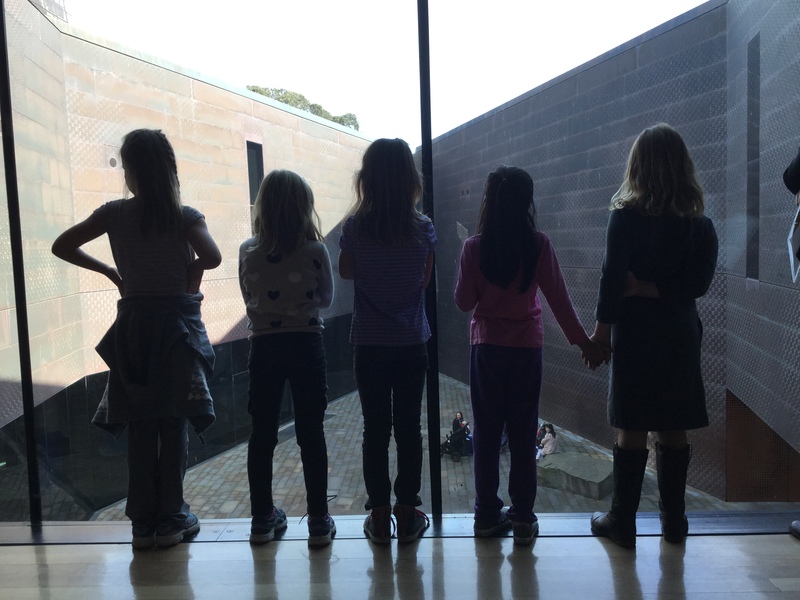 I chaperoned my daughter’s field trip to the de Young Museum last week. I’ve always loved art museums; I studied fine art in college, I still paint when I’m able, and I’m really into the idea of public/organizational spaces being galleries of human creativity. 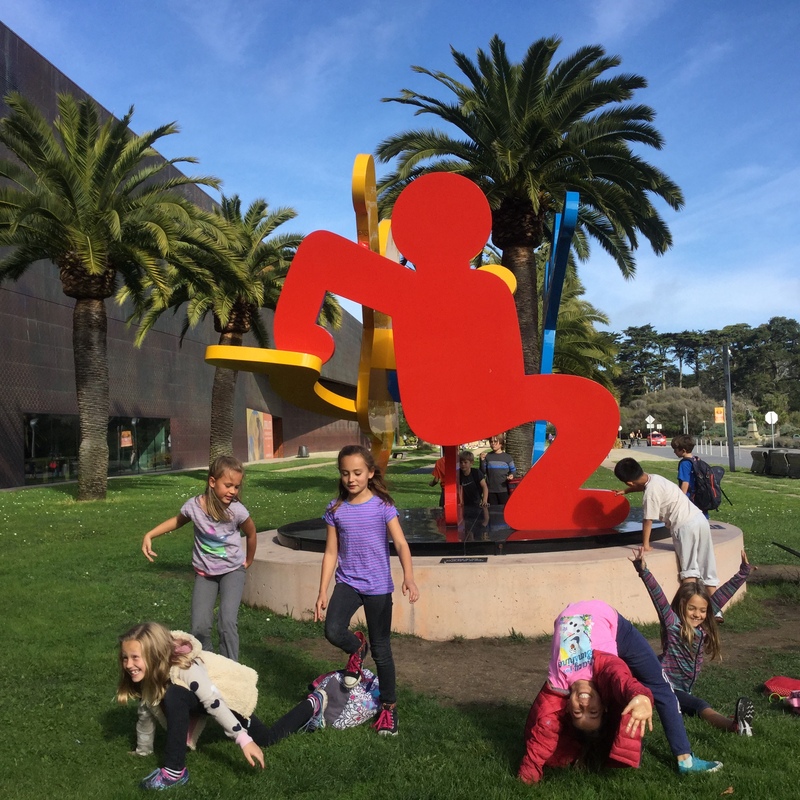 But even better is to see what a group of eight year-olds does when let loose inside (and outside) the hallowed spaces of a major bastion of contemporary visual culture. The moment we gathered to hear from our guides about our upcoming experience (and how to do the near-impossible-for-8-year-olds by not running/jumping/shouting/pushing), I immediately thought about this as the perfect location for professional development. 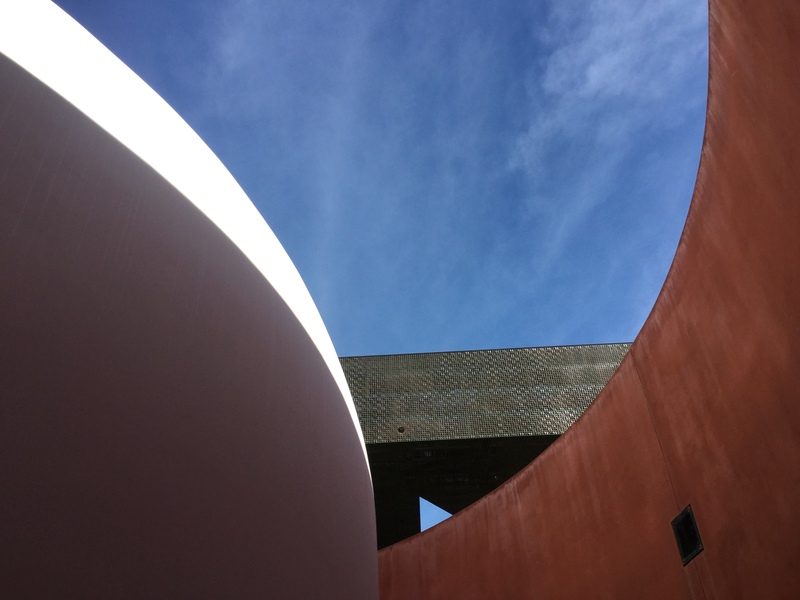 Much like #OpenAirPD, visiting a museum is a chance to invite new connections (between people, between ideas) by disrupting our patterns of interacting and shifting away from the spaces in which we are accustomed to working with each other. 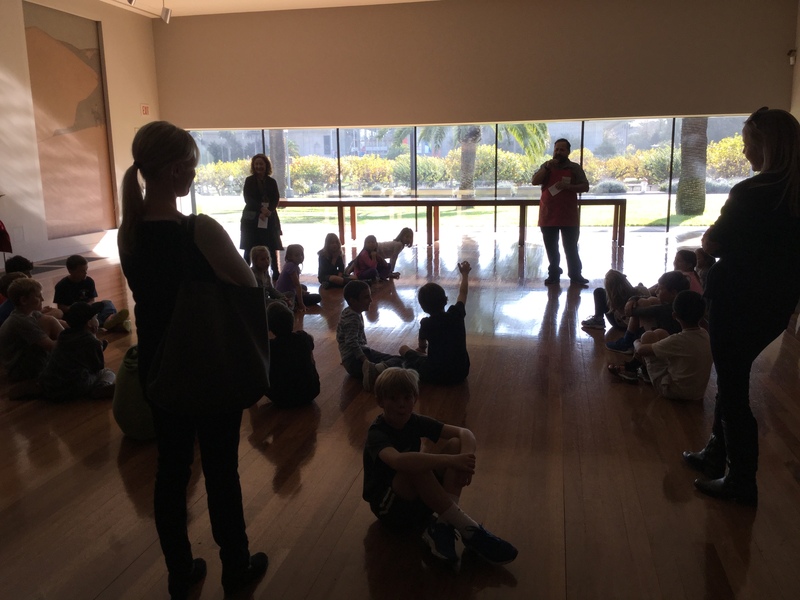 If a museum like the DeYoung isn’t within easy reach, I would recommend taking your staff PD to a sister campus (and invite that school to yours) – anything to step away from our typical landscape. In the spirit of cross-pollination, nothing seems more fitting to PD for educators than visiting a public institution dedicated to creativity and innovation. It’s also got cool features like a cafeteria with pastries (and other good food) – so basically you’ve covered Maslow from the most basic to the most exalted. Good PD experiences always begin by attending to our most fundamental human needs – safety, comfort, goodies! 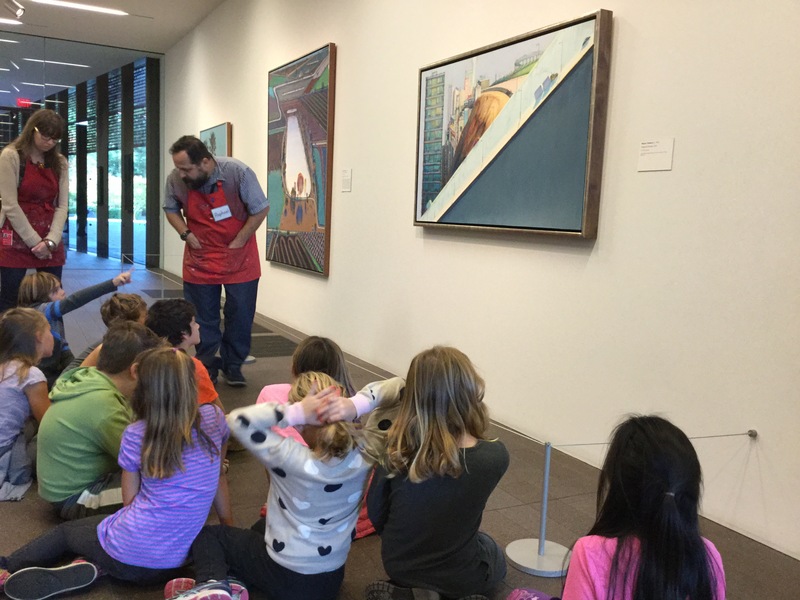 The artist/docent took half our group on a tour of a few different pieces (here considering a Wayne Thiebaud). I really liked some of the questions he shared with the kids to get them to look beyond the most obvious aspects of the work. Studies show that, on average, people look at a painting for 15 seconds or less (including the Mona Lisa!). Have small groups form and pick 6-8 works to consider through the lens of these questions – spending five minutes at each piece, just to make sure we are shattering the average! What feeling is the artist trying to impart through this work? What specifically makes you think this? How did the artist feel when creating this piece? What feelings emerge after one minute of looking? After five? What aspect of the work did you not notice at first? What did you find yourself focusing on? What surprised you most about this piece? We often focus too much on the work itself; what about the shadows they cast? Ordinary objects (burned driftwood) can suddenly take on an ethereal quality. Are there spaces inside/outside your buildings that invite the same sense of shifting? 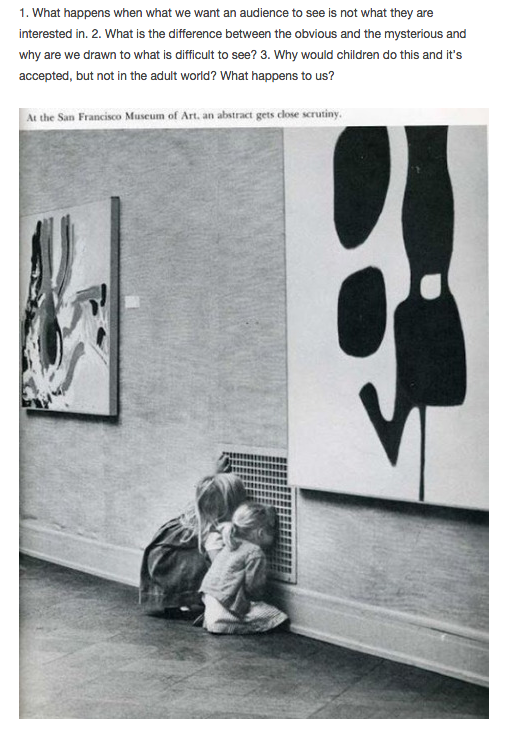 One of the first things I came across upon discovering my favorite blog is the image below – exactly the reason why we need to have children running around museums, paying attention to things we adults fail to notice. 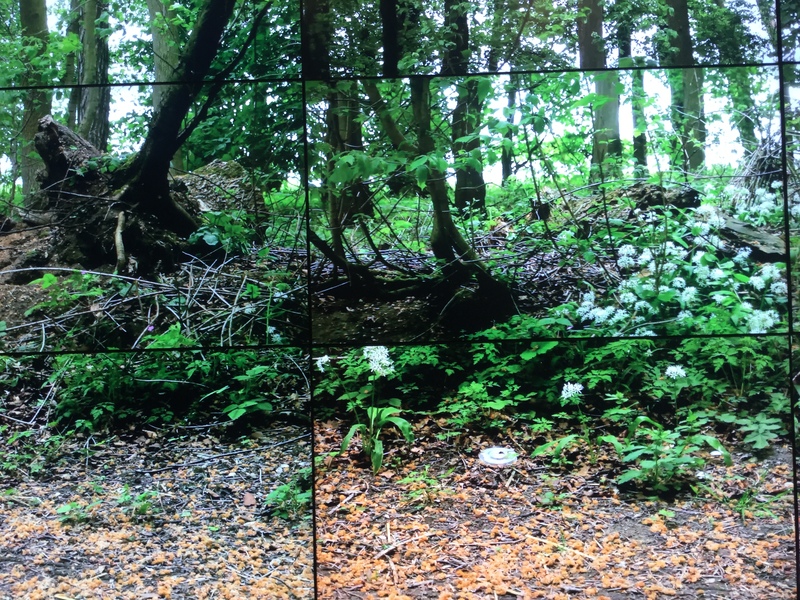 What are the things we fail to notice in our own working/learning spaces? Sensory prompt: Find a spot and stand/sit there for 10 minutes. No speaking, just noticing the forces at play around you and how your senses respond to them. Quick write/sketch. 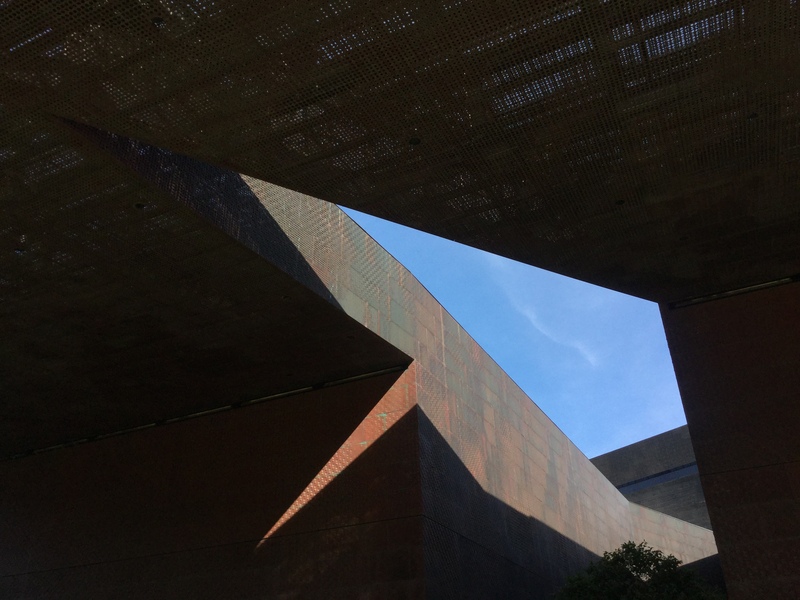 After several visits to the de Young, I realized I had not known they have an installation from artist Roger Turrell (maybe it’s time to study the museum guide more carefully!). I’ve included Turrell in a previous post about transparency (spaces that encourage it); the beauty of freely wandering around a space is stumbling across surprises like this. Vertical panoramic of the interior. Bodies/light in motion! A kiva-like gathering space. 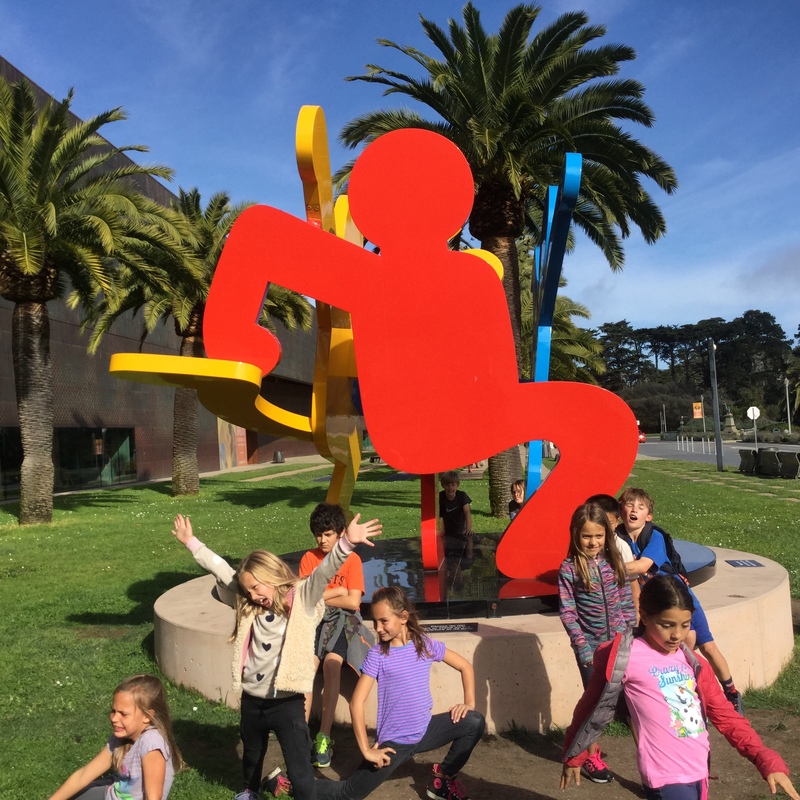 It’s hard to sit still around the Keith Haring sculpture. 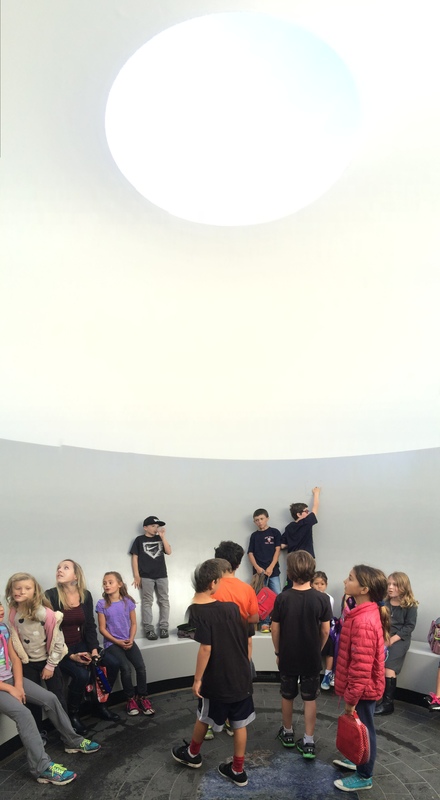 Like the Turrell Skydome – a study in motion. The last time I visited was to see the David Hockney exhibit – the most powerful show I have ever seen. Why so powerful? 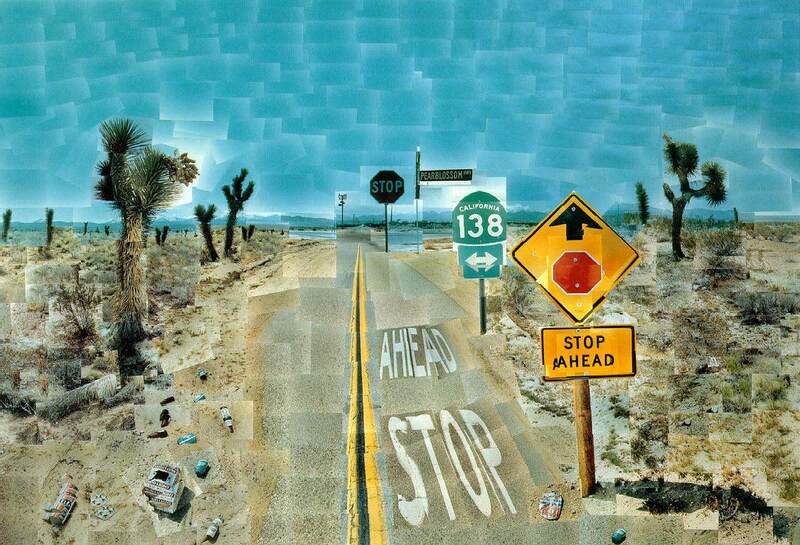 Hockney’s passion for exploring new media (from watercolors to iPad drawings) and his unique way of representing multiple perspectives that contribute to a greater whole (you’ve seen the famous polaroid assemblage from the desert). 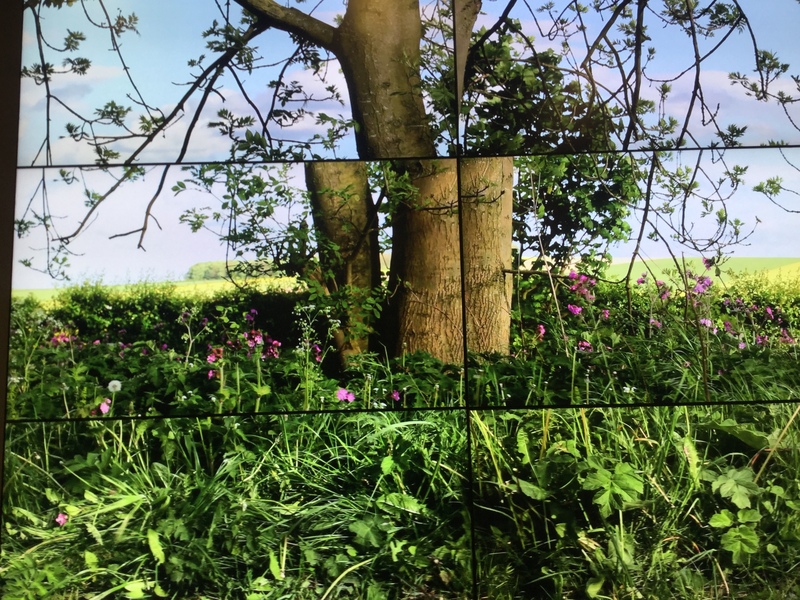 Thankfully the de Young has an installation of his York landscapes; 18 screens that each capture a slightly different view while moving “forward” to the right at subtly varying paces. 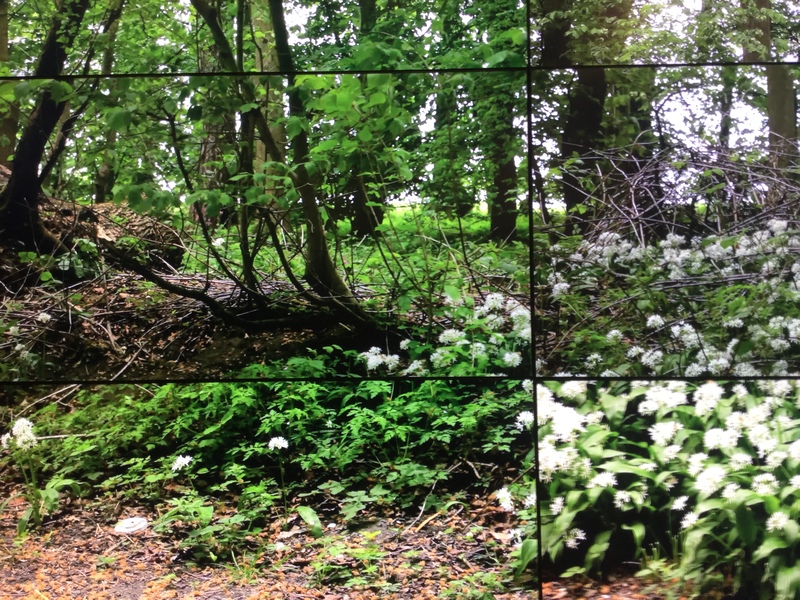 The 12-minute piece takes us through a variety of landscapes, not bothering to edit out (or pick up in advance) trash along the side of the road (notice the plastic cup cover in the second and third images below). 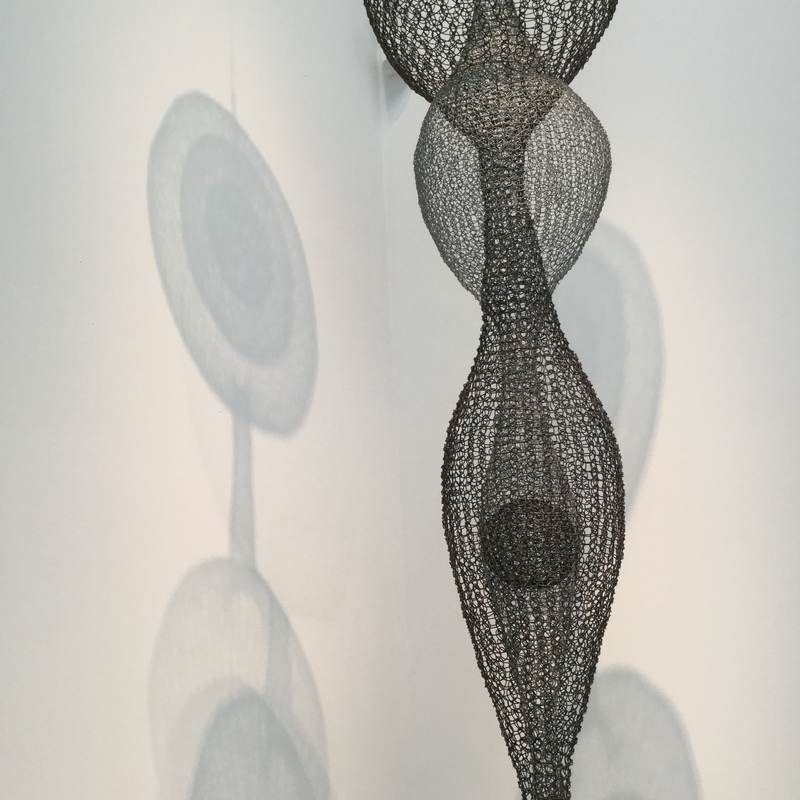 Professional development experiences can feel like the shadows cast in the works above; hard to grasp, lacking weight/texture, slipping from our memory as time/school days ceaselessly hurtle forward. Equip a few different members of your staff with an iPad or other video-recording device and have them create a 5-8 minute “documentaries” of the day capturing the place and the people (invest wisely and get these people a release day to do this work). Have your next meeting be a showing of these films. Then share the films with your students (and us on social media). I like this notion of PD as something more than inspiring (inspiration often is a reaffirmation of what we already think/feel/believe); at its best it can take us by surprise – offering a view of something we hadn’t yet considered, or that we had overlooked. Posted in Art and Creativity, Leadership, Learning Spaces, Meetings, Organizational Growth and Change, Personal Growth and Learning, Professional Development, Teaching, UncategorizedTagged Art, Creativity, David Culberhouse, David Hockney, David Theriault, learning spaces, museums, OpenAirPD, PDBookmark the permalink. ...how difficult can that be?